Dentists Bondi Junction Dentists family dental care believe in prevention rather than cure. There are a number of treatments available to make this a reality. Our dental team at Dentists Bondi Junction Dentists firmly believe in the value of preventive dental care. 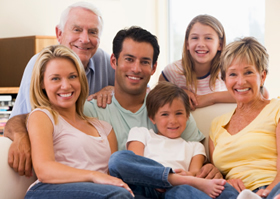 Our aim is to help you as a family to learn about good oral health and understand how to maintain the health of your mouth in order to keep it free of tooth decay or gum desease. We are happy to register the children of our regular adult patients. To enable us to give the best possible care to your children, we should see parents regularly so that we can adequately monitor and maintain your family oral health. We recommend that you introduce your children to dentistry at an early age, (6 months onwards) we will always endeavor to make their visits as enjoyable and relaxed as possible. Our rooms are spacious and airy and modern with television and videos and a lively aquarium. We welcome patients of all ages and pride ourselves on our sensitive and gentle approach with nervous patients.